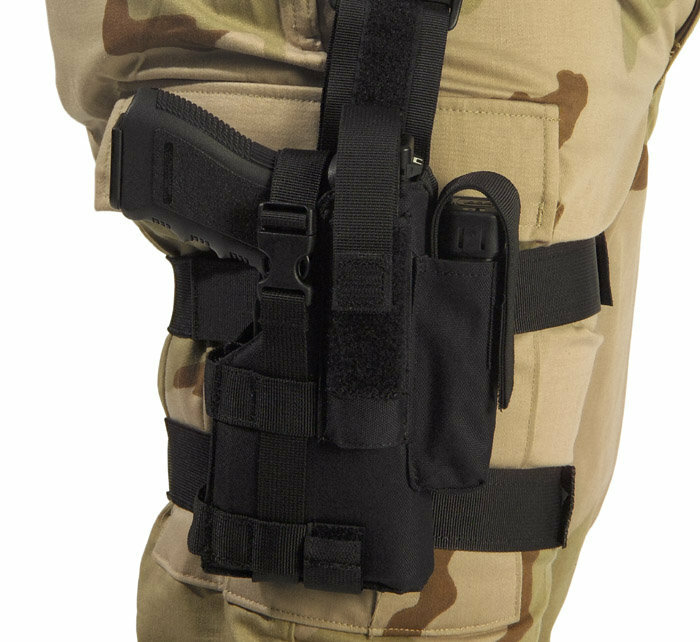 Elite Survival Systems Tactical Thigh Holster fits FsN pistols with or without a tac-rail mounted light or laser attachment. The barrel end is open for threaded barrels and suppressors. This tactical thigh holster with light is constructed of padded nylon with a rigid core which holds the holster's shape for quick and easy reholstering. It has a dual thumb-break retention strap system, plus an extra removable security strap for use in extreme conditions. Nylon thigh holster is secured with an adjustable drop belt strap, and dual adjustable thigh straps with no-slip backing. It has an adjustable mag pouch on the outside for a spare magazine.